By now, you’ve probably heard the story about the three boys who were lost at sea for 50 days, surviving on raw fish and a misguided seagull before a fishing trawling found them last Friday. But here’s the rest of the story: Filo Filo, 15, Samu Pelesa, 15, and Etueni Nasau, 14, (pictured above) were boating from their village on Atafu atoll north of Samoa to the neighboring atoll of Nukunonu when their boat ran out of gas. Where were they going? To find vodka. “We were drunk, we were drinking,” Etueni said at a news conference, according to The Daily Telegraph in Australia. Added Filo: “We went to look for more, cause we had finished our bottle.” The boys are expected to finally return home on Dec. 16. Said Etueni, on what they’ll do when they get home: “We’re just gonna get there and celebrate, we’re gonna have a party when we get there.” Oh no! Someone quick, hide the boats. The Daily Telegraph. Conner Peitsmeyer, 11, was fishing with his dad in 35-degree weather at Aurora Reservoir last month when the lad caught the 6-pound, 8-ounce state-record bass. “When he caught that first big one, Conner told me he was shaking,” his father Michael told the Colorado Division of Wildlife, “but he wasn’t sure if it was from the cold or from the excitement.” Colorado DOW. Six friends went deer hunting on Kodiak Island last month. 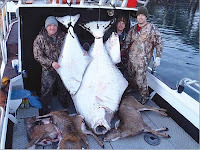 The hunting was slow, so they decided to go fishing for halibut. Good idea. Andy Workman and Jason Bergman of Wasilla combined to land what is believed to be the biggest halibut ever caught out of Kodiak. It was an estimated 405 pounds. 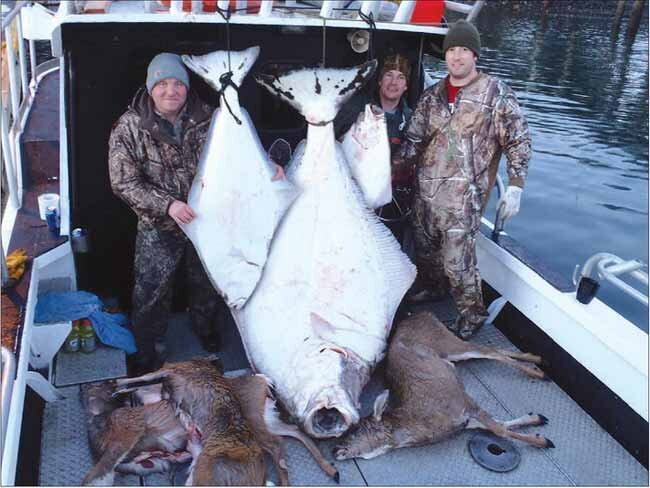 In all, the group caught three halibut and bagged nine deer. “We brought back about 630 pounds altogether,” Workman told the Fairbanks Daily News-Miner. “Alaska Airlines loved us.” Fairbanks Daily News-Miner. An unidentified girl running in a 5K run in New Jersey on Thanksgiving day was among 2,000 runners but was the only one knocked to the ground by a deer. The deer ran across the road and straight into the girl, according to NorthJersey.com. It didn’t say whether she finished the race or was like a human caught in headlights. NorthJersey.com. A Wisconsin bowhunter bagged two deer for the price of one arrow last month. (OK, he admitted using two but didn’t need to). WEAU.com reported that Rodney Hurst of Hixton was standing alongside a corn field when he spotted two fighting bucks, a 10-pointer and a 12-pointer. The younger one finally won the battle, but couldn’t untangle itself from his conquered foe. Their antlers were locked. Hurst called the fish and wildlife folks, paid for an additional deer tag and bagged 'em both. WEAU News. At age 76, Bea Leach still has a steady aim. The Times Herald in Port Huron, Mich., reported that the grandmother took the deer on her property about 35 miles northeast of Detroit. Her grandson Zachary Leach, 14, who also took a deer this season, told the Times Herald it’s “cool” that his grandma hunts because “you don’t really hear or see any grandmas that are 76 and still shooting deer.” Playing bingo, maybe. Washington Post.